Terriers take on #2 Boston College tonight at TD Garden in the 62nd annual Beanpot Tournament. Puck drop is approximately 8 p.m. for the game, which is to air live on NESN. BU has won 29 of the previous 61 tournaments, most recently in 2009. The teams last met on Jan. 17, when BU rallied from a 5-2 deficit to close the gap to one, before an empty-netter foiled the comeback. Matt O’Connor’s 46 saves in BU’s 3-3 tie with UMass earned him Hockey East Co-Defensive Player of the Week honors, while Cason Hohmann, who had a goal and an assist, was named to the weekly top performers list. Feb. 3, 1992—All-American David Sacco broke a 4-4 tie with Northeastern in the final three minutes of regulation as the Terriers advanced to the finals with a 5-4 win. BU received two goals from John Lilley and one apiece from Mike Pomichter and Mike Prendergast, while netminder Scott Cashman gained his third Beanpot win in goal. A week later, BU would beat Harvard for the championship with Cashman taking home MVP honors and the Eberly Trophy for top goalie. Fun fact: In eight previous opening round games played on Feb. 3, BU has a perfect 8-0 record and went on to win the Beanpot Championship six times, most recently in 2003. ►The Patriot Ledger’s Mike Loftus talked with Steve Greeley about his decision to leave the NHL scouting ranks to become Associate Head Coach of the Terriers under first-year head coach David Quinn. Greeley, a 2004 BU grad, was a professional scout for the Los Angeles Kings before returning to his alma mater. In the eight months since returning to BU, he has made a significant impact, working with the Terrier forwards and securing a slew of recruiting wins to bring high-level talent to the BU pipeline. On January 22, we reported on three ex-Terriers, Scott Shaunessy, Mike Sylvia and Kevin Schaefferheading to Sun Valley, Idaho, to participate in film maker Bobby Farrelly’s ninth annual charity games to benefit the Atkins Park Penguins. Here is Scott’s report on the hard-fought games. 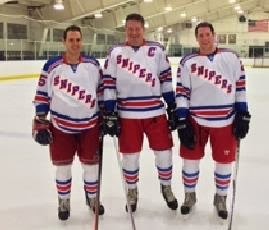 Former Terriers from three different decades returned to the glory days (sort of) in Sun Valley Idaho this past weekend as members of the East Coast Snipers who played a two-game (3 x 20 minute periods) full-contact series against the local Sun Valley Suns in front of packed crowds at the Sun Valley Arena. All three got on the stat sheet over the weekend led by Schaeffer who had two goals on the weekend, including the game winner on Saturday in Sudden Death Overtime. Sylvia tallied a goal in Friday’s game and Shaunessy had an assist on Saturday and no penalties in 2 games (Coach Parker would have been proud).